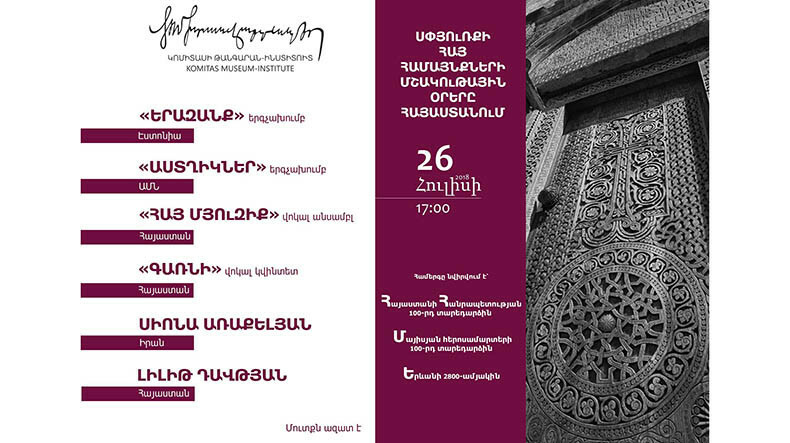 Armenia’s Komitas Museum-Institute is hosting the Culture Days of the Armenian Diaspora Communities, the museum said in a Facebook post. The concert scheduled to be held on 26 July as part of the event is dedicated to the 100th anniversary of the First Republic of Armenia and the May heroic battles, as well as the 2800th anniversary of the foundation of the Armenian capital city of Yerevan. The participants of the concert include “Yerazank” (Dream) choir (Estonia), “Astghikner” (Starlets) children’s choir ensemble (U.S.), pianist Siona Arakelian (Iran), as well as soprano Lilit Davtyan, pianist Hasmik Hovsepyan, Hay Music Vocal Ensemble and Garni Vocal Quintet from Armenia. The concert program features music by Armenian composers.